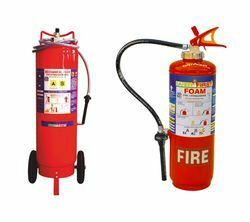 With the assistance of well-equipped infrastructural setup, we are engaged in offering a quality approved a range of Foam Type Fire Extinguisher to the market. Additionally, the inputs sourced for their development are of high quality and checked sternly before used in the production process. 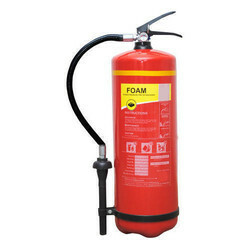 With the help of our meticulous staff, we deal in the arena of offering premium quality of Mechanical Foam Based Fire Extinguisher, which is delivered in recommended time frame. In line to meet numerous requirements of customers, these Foam Fire Extinguisher are hard framed and supplied in the market in complete safe packing. Ideal for use on burning liquids like oil and petrol, FFSS’s Foam Extinguishers, use the squeeze grip mechanism, making them faster and easier to use. The proprietary stored pressure technology also delivers high power throw, making these extinguishers extremely effective.